Meet Marcel Petiot, the French doctor who promised Jews safe passage from Nazis, only to rob and murder them. The inherent grisliness of murder makes it hard — if not impossible — to describe any murderer as “better” or “worse” than another. Still, Marcel Petiot was truly superlative in his horror, mainly because of the circumstances and motivations behind his acts: he promised safety and freedom to those leaving Nazi-occupied France, only to strip them of their possessions and lives. Despite his infamy in France, many elsewhere have never heard his story. As with many serial killers, internal struggle marked much of Marcel Petiot’s early life. Born in France in 1897, multiple schools throughout France expelled him for his behavior, though he did finish his schooling by age 18, in 1915. Petiot then enlisted in the military, however the extent of his service is debatable as he spent long periods of time away on “rest,” likely due to his kleptomania. Eventually, his consistent thievery — particularly of military blankets — got him jailed for a short period in Orleans. Military officers finally discharged Petiot with disability benefits at the recommendation of a psychiatrist who believed Petiot had a mental breakdown of sorts: Indeed, the troubled officer had literally shot himself in the foot and required a hospital stay. After his bout in the military came to a close, psychiatrists recommended Petiot be committed to an asylum. Instead, he interned at one while attending medical school. Petiot graduated in eight months, and with his medical degree in hand went to work in Villeneuve-sur-Yonne in 1921. There, Petiot almost immediately became addicted to two things that would define the rest of his life: narcotics and murder. It’s never been proven, but many suspect that Petiot’s first victim was Louise Delaveau, his lover and the daughter of one of his patients in Villeneuve-sur-Yonn. She disappeared in 1926, shortly after the two began having an affair. No one heard from Delaveau again. Though when authorities began conducting an investigation into her disappearance, neighbors reported that they had seen Petiot putting a large trunk into his automobile — perhaps, some said, with her body inside. Police investigated it, but found nothing to link him to the crime. Shortly after Delaveau’s disappearance, Petiot decided to run for mayor of Villeneuve-sur-Yonne — a seat he won since he hired someone to cause a commotion during a debate and fluster his opponent. The corruption continued in-office: the first thing Petiot did upon becoming mayor was embezzle the town’s money. After a brief cycle of resigning political posts only to be voted into another, Petiot , his wife, and their young son moved to Paris and began to build up a successful medical practice at 66 Rue Caumartin. During all of this, Petiot was briefly institutionalized for his persistent kleptomania. While the outbreak of WWII and the fall of France to the Nazi regime likely overshadowed whatever concerns anyone may have had about that, he didn’t evade the law entirely. The physician was fined 2400 francs for his prescribing illicit narcotics, a charge for which he would have gone to trial had the two addicts set to testify against him not disappeared under mysterious circumstances shortly before the trial began. Wikimedia CommonsParis during World War II. 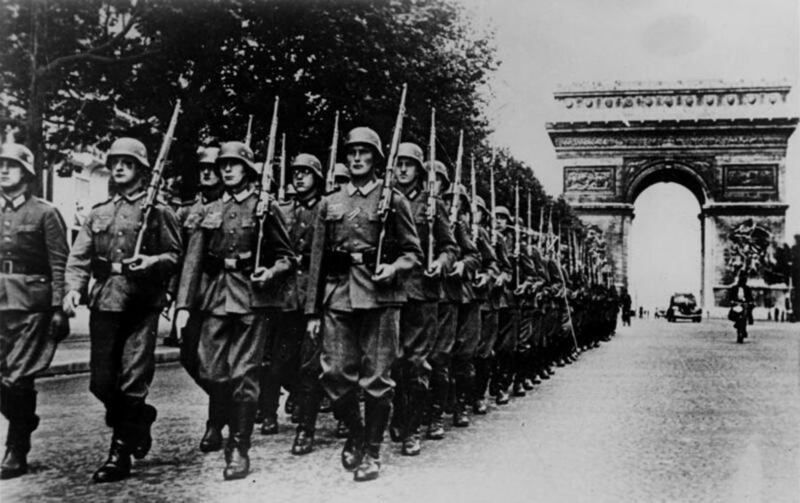 For Petiot, Nazi-occupied France provided the perfect backdrop in which he could commit his crimes. Indeed, the country stood divided primarily by Nazi sympathizers and those actively trying to overthrow — or outrun — the Gestapo. Petiot capitalized on the state of fear, taking advantage of the latter. He began to conceive a plan that would be both fiscally, and corporeally, lucrative. This started by professing himself a member of the French Resistance, perhaps to garner public trust and admiration and thus better conceal his illicit acts, which increasingly involved the sale of illegal drugs. He went so far as to invite Jews to his practice at 66 Rue Caumartin, promising them safe passage out of Nazi-occupied France. He also offered his home as a safe house for resistance fighters, petty thieves, and hardened criminals trying to outrun the law. Still, what seemed like a noble cause on his part would turn out to be the beginning of one of the most horrifying killing sprees in history. Petiot, working under the name “Dr. Eugène,” promised safe passage out of France to anyone who could afford his 25,000 franc fee — which when adjusted for inflation would work out to nearly half a million dollars today. He also hired several “handlers” who helped round people up — they would, of course, later be tried as accomplices. No one ever heard from those who took Petiot up on his offer — mainly because he killed them all. He would tell his clients that before they could leave the country they needed inoculations, which he gave them — though in fact he injected them with cyanide. Petiot then took all his victims’ valuables and dumped their corpses into the Seine. Only the Gestapo would force Petiot to change this practice: As the Gestapo’s presence in the streets of France grew, it became too risky to take the bodies out of the house and dispose of them. So, after his first few kills, Petiot started putting the bodies in vats of quicklime to disintegrate them. In an event only someone like Petiot could make happen, the Gestapo effectively acted as the “good guy” and, upon catching wind of “Dr. Eugène’s” activities, arrested his accomplices. Under torture, they revealed his real name — Marcel Petiot. By the time the Gestapo went to find him, Petiot had fled to another part of Paris. Now working out of 21 Rue le Sueur, sans his lackeys, the task of disposing of the bodies of those he had killed became overwhelming. For reasons that remain unclear, Petiot left town for a few days in March of 1944. While away, his neighbors began to notice a terrible odor emanating from his house, and that the smoke radiating from his chimney was unusually noxious. When the police arrived to investigate, thinking perhaps there was some kind of fire, they found a note on the door saying Dr. Petiot was out of town but would return in a few days. They proceeded to contact him and let him know about his home’s abnormal condition. Petiot told them not to enter the house until he arrived. Police waited for nearly an hour before they entered 21 Rue le Sueur along with firemen. What they found was unlike anything they’d ever seen: bodies — not even whole bodies, just parts of bodies, were strewn about the house. Some were in canvas sacks or suitcases. The garage had vats of quicklime, an incinerator filled with limbs and bones — all told, they found at least ten corpses in the house, though none of them were intact. Petiot arrived shortly thereafter, attempting to explain that he was a member of the Resistance and that the bodies were those of Germans and traitors who he had slain. The police believed Petiot’s tale enough not to arrest him then and there — which, given the tumult in which France found itself and how venerated the Resistance was, is somewhat comprehensible. Still, Petiot’s tale didn’t convince everyone, and Commissaire Georges-Victor Massu took charge of an official investigation into the man he believed was a “dangerous lunatic.” Once he rounded up Petiot’s wife and brother, Maurice, along with the men who had helped Petiot when he lived at 66 Rue Caumartin, the true picture came together. The police arrested all of them as accomplices. When they arrived at Petiot’s home to arrest him and charge him with murder, he was, of course, gone. 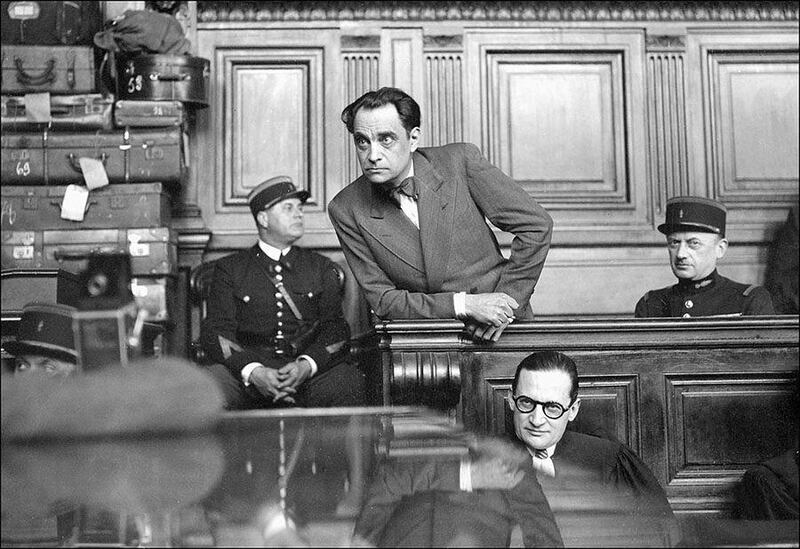 AFP/Getty ImagesMarcel Petiot (upright, center) stands trial in Paris in March 1946. The Invasion of Normandy in June of 1944 put the search for Petiot on hold. Using the war to his advantage yet again, Petiot hid with friends, explaining that the Gestapo pursued him because he’d murdered some informers. Throughout this period, Petiot took on a number of different names, let his hair and beard grow out, and managed to evade capture for at least another month. Unable to keep a truly low profile, Petiot actually did join up with Resistance fighters, a move which would garner him praise — and lead to his undoing. While operating under an assumed name, Petiot gained so much notoriety as a Resistance fighter that a French periodical ran a profile of him. When papers hit the stands, several people recognized him as Petiot and alerted police that the murderer, in fact, was still in Paris. Someone recognized Petiot at a train station in February of 1944, at which point police arrested him and charged him with murder. 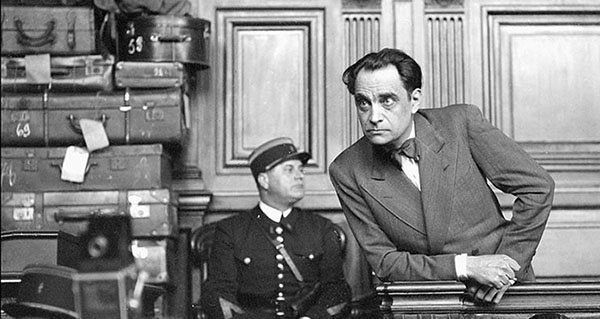 Marcel Petiot went on trial on March 19, 1946 with 135 criminal charges. Throughout his trial Petiot maintained that he only killed enemies of France and that he did so simply to carry out his duties as a Resistance fighter. In supporting his case, he made the misstep of listing some Resistance groups by name — groups which trial attendees told Petiot did not exist. Once the investigation revealed that Petiot had stolen from those he killed, he was charged with murder for profit. Over the course of his murders, Petiot made off with more than 200,000 francs — something like $2 million. Over the course of the trial, Petiot admitted to killing some, but not all, of the 27 victims found in his house. Throughout his life he had killed at least 60 people, though he was convicted of 26 murders. The court sentenced Petiot to death by beheading. He was guillotined on May 25, 1946. Although Marcel Petiot was a prolific killer, had he not been so greedy — his asking fee for freedom far too high for most people at the time — he no doubt would have killed even more, rivaling the murders of the groups he claimed he fought against. Next after reading about Marcel Petiot, learn about the most terrifying serial killer couples ever, as well as the story of Olga Hepnarova, the truck-driving mass murderess.